If you are having a hard time getting rid of the sickness you had 3 days ago, it's very possible that you need medical assistance from a professional. That's the first step, and the second is to get your medicines at CVS Pharmacy Store. But before you do that, I also recommend you to see the CVS Ad Preview with the deals that are effective starting on Sunday. 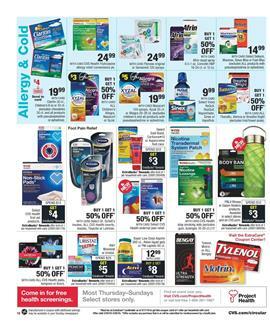 It's the simplest thing to find an allergy or cold relief in the CVS Weekly Ads. You will find supplies that aim different areas of health-care including sports products. PBLX fitness or Galam restore products will give you $3 when you spend $12 on them. Buy Mucinex, Sinus-Max, Fast-Max, for only $14.99! Find products of Tylenol, Motrin, Bengay with ExtraCare savings at CVS stores next week. BOGO 50% off PreserVision or Ocuvite products including eye vitamin chewables, Blue light, and more. CVS health multi-purpose solution and eye allergy relief are BOGO 50% off. Also, take a look at the final page for CVS Photo deals. Follow our Facebook page where you can find a way to track these deals. Subscribe to the CVS Ad to get emails. Explore the range of products that come with ExtraBucks rewards, $10 cash card, and instant coupons. Save more with instant coupons. Earn ExtraBucks rewards with your purchases such as Fructis, Tresemme, L'Oreal on the first page. CVS health vitamins will be BOGO Free deals next week. Get $10 Cash Card for your $30 purchase of Scott bath tissue, Ghirardelli chocolate, and more. Hershey's original, Easter Kisses, miniatures, and exclusive products are available. 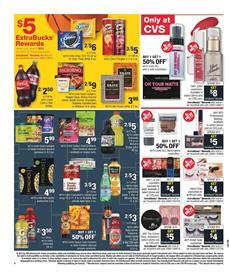 Shop beauty products and earn more ExtraBucks with your purchases of products on pg 2. Maybelline cosmetics, CoverGirl, L'Oreal, Physicians Formula cosmetics in the range. A new product is also available. CVS health pain relief is a new one that is a BOGO 50% off deal! Get $15 for $40 spent on Zyrtec, Benadryl, or Rhinocort. Stock your candies for Easter starting on Sunday at CVS. KitKat, Snickers, M&M's, Skittles are a few of the candies from that range. Easter Bunny and more decorative toys or accessories are also available in this selection. Get your breakfast foods, fiber sources, protein, and cereals at CVS Stores. Make your coffee with Maxwell House, have some Kellogg's quaker life cereals. Pay lower for all these products at CVS stores next week. You can follow us on the Facebook page. Subscribe to the CVS Weekly Ad to get emails. Underwear for women and men are on sale at CVS stores. 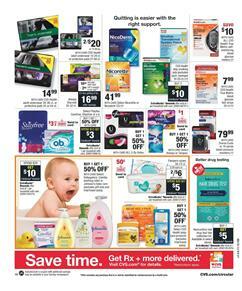 Protective pads, other feminine care items, and ExtraBucks rewards are on pg 12. BOGO 50% off U by Kotex and Always or Tampax this week at CVS Stores. Send $1 off coupon to your card to get discount. CVS health products like blood pressure monitoring system are $10 cheaper next week. Buy allergy, cold, pain relievers. Sometimes people work harder reducing the sleeping hours. Hunger and sleepy body will cause a headache during the day. They are trouble together. Taking a pain reliever will take the pain away and you'll be able to continue your day peacefully. If you are on a diet or something, vitamins and supplements might be useful to support your body. People try to lose some fat with eating less food but they will eventually lack some essentials like vitamins. It's easily supported by these packs of vitamins on the ad. Advil, ibuprofen, Bayer, MiraLax, Dr Scholl's, and brands are the popular ones from this Ad. 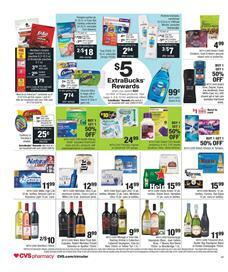 Earn a lot of ExtraBucks rewards for your purchases of the product list of CVS Weekly Ad Mar 17 - 23. Cosmetics brands like Covergirl, Maybelline NY, Revlon, L'Oreal, and many more will be next week's beautiful range of CVS Ad. If you like to have candies and snacks around, you might want to spend less on them with the deals. Extrabucks Rewards are also available with snacks. Some of them are exclusives such as Hershey's Easter Kisses, eggs, miniatures. The price is 2 for $4 on that item which is available on the first page. $5 ExtraBucks rewards on household products like Tide, Dawn, Pantene shampoo, Pampers jumbo pk. on pg 2. Popular snacks, cookies, candies, chips, coke, and more will be on sale, too. $3 ExtraBucks rewards when you spend $15 on Oreo Cookies. Early Easter sale is also one of the categories here. Save on Easter singles, Mars, Snickers, Hershey's and plush toys with Multiple buys. You will find a lot of products in the ad. It's easier to find them using the ad preview. There is also a mixture of snacks including Gold Emblem, belVita, Kellogg's breakfast products, and like-class items of good food are in the CVS Ad. Again, a lot of BOGOs and coupon savings can be your choice for saving more. Also, browse the household deals in this range. Check out beauty products, health care, makeup items, hair care, more Extrabucks rewards in this ad. Follow our Facebook page to get these on your feed. Subscribe to get emails about posts with the content of nice discounts. Buy your makeup products at CVS for lower prices and earn ExtraBucks rewards. We can see new ExtraBucks rewards on makeup products of NYX, Kiss eyelashes, L.A. Girl, The Créme and more on pg 5. 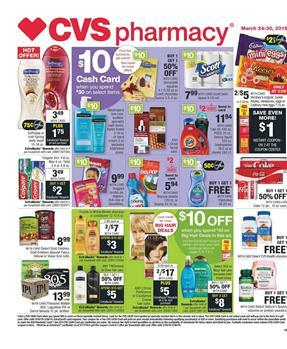 CVS Weekly Ad offers new products. The new ones are wet n wild cosmetics and JOAH products that you can find on pg 5. Shop personal care items like Dial body wash and special prices of more cosmetics. Gliss hair care will cost $10 for 2. Spend $20 on Schwarzkopf, göt2b, Right Guard, and more to earn $7 ExtraBucks rewards. $15 mail-in rebate when you buy $50 of Olay or P&G beauty products. One of the popular products of this category is Dove Men+ care. You can find it on pg 6. BOGO 50% deal will be valid on this product. Spend $20 to get $5! 25% off Aveeno facial care. 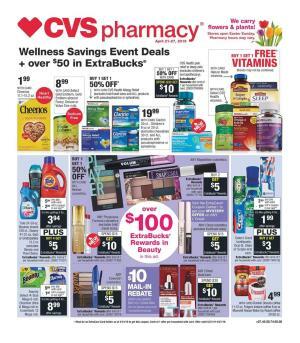 Many more deals and products will be in the CVS beauty aisle this week. Hair care is one of them. Hair might be the most important part of style and we need to take care of the health of it. Suave shampoo, John Frieda hair products, and more featuring BOGO deals are possible to find in the beauty products range of the latest CVS Ad.